Is the world's first glasses-free 3D smartphone worth the premium price? LG has had a good run of form with its Optimus series of smartphones. The Optimus One was a solid little thing for a good price, then it branched out and up into fancy phone territory with the quirky dual-core charms of the Optimus 2X, before tackling high style with the skinny Optimus Black. Now LG has another demographic in its sights – fans of the hot trend for 3D technology. The Optimus 3D is the first smartphone to launch with a "glasses-free" 3D display, enabling users to take still photos and record videos in full 3D, then play them back in 3D on the phone's cutting-edge 4.3-inch display. But thanks to what LG calls the phone's "tri-dual" technology – a dual-core processor, dual cameras and dual-channel memory – the Optimus 3D comes with a massive price tag. The cheapest monthly tariff for this monster 3D phone currently stands at £35, with SIM-free prices currently around the £500 mark. Is it worth paying such a hefty early adopter tax in return for LG's – and the world's – first glasses-free 3D mobile phone display? The Optimus 3D is as hefty as its price tag, but at least you're getting your money's worth in terms of sheer physical bulk. The 4.3-inch 480 x 800 resolution screen is surrounded by a large black plastic bezel, making the LG Optimus 3D feel like a whopping great rubbery brick in the hand. Beneath the screens sit four capacitive touch buttons. They're in a bit of an unusual order, with LG opting to be a pain in the arse by lining them up, from left to right, in the order of Menu, Home, Back and Search. The Menu button shouldn't really be given prime location on the left-hand side. We'd prefer the much more frequently pressed Home or Back to be there, as it's the easiest spot to find without searching. These buttons are backlit, but the light only comes on when you press one of them. Which makes the backlight absolutely useless, as there's no point in a button lighting itself up once you've just pressed the wrong one. A weird feature, that. The LG Optimus 3D is also a fat little monster, coming it at 11.9mm thick – much chunkier than the 8.5mm Samsung Galaxy S2. It also weighs 168g, so is much heavier than the S2's 116g or even the larger HTC Sensation's 148g. There's what appears to be a camera shutter button on the bottom of the right-hand side, where camera buttons usually congregate. 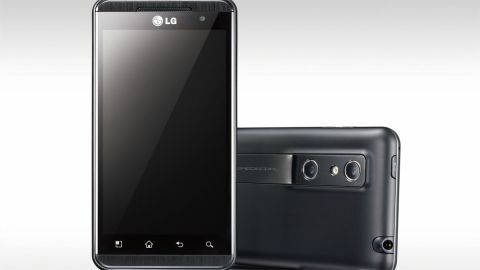 But it's not a camera button – it simply toggles the camera between 2D and 3D modes when taking shots, or can be held down to launch LG's separate 3D interface when using the Optimus 3D. The only vaguely interesting physical design feature here is the metallic strip along the phone's rear, which houses the Optimus 3D's two camera sensors and its LED flash. It's one nice touch in an otherwise quite generic lump of black plastic. The rest of the phone is your standard modern smartphone layout. Power button and 3.5mm headphone jack along the top, volume up/down rocker along the right-hand edge, then USB and HDMI connectors safely hidden behind little plastic stoppers in the top-left corner. It feels solid and heavy, which isn't a bad thing because our brains tend to associate gadget weight with quality, but the Optimus 3D is a very bland plastic black rectangle on the outside. Hopefully the "tri-dual" thrills inside will make up for this uninspiring design.